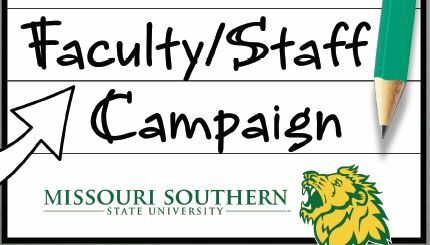 If you haven’t yet joined the 2016 Missouri Southern Faculty and Staff Campaign, there’s still time! The campaign is a fundraising effort that offers YOU an opportunity to help YOUR university and the students we serve. Each gift to this campaign is significant. As members of the faculty and staff, you INSPIRE our students, you INFLUENCE our campus, you INVEST your time and talents, and now you can IMPACT our students by making a gift to the MSSU Faculty and Staff Campaign. Remember, you can direct your gift so that it benefits an area that is important to you! Whether you give to support our university’s general needs, or whether you specify an area to receive your gift, you will be making a lasting impact with your generosity. For more information, please contact Elisa Bryant in the Missouri Southern Development Office at 625-3039 or Bryant-E@mssu.edu. PreviousThe Game Plan: Victory is on the horizon!